Progress continues at a solid pace on our march to the start of Beta 1 on July 4th. We’re still on track as we continue to churn out features, assets, and fixes! Ben, Max, and I (Tyler) enjoyed our usual weekly wrap-up this afternoon. If you missed that livestream, you can catch it HERE. There were a lot of great questions during our Q&A section of the stream, especially because Ben was there to field all sorts of interesting design questions. We spent much of this week testing fixes on our current testing build, leading up to another weekend of testing! We said we had our Beta 1 level Backers in mind, and we’ve been wanting to get you into a more stable test for a while! So, this weekend, we have an opportunity to find out how stable this build actually is! Testing: This week, Colin focused on improvements to the physics server crashes we have been experiencing. Compared to the previous fix, this one does not significantly impact performance with large scale battles, tested at 3k A.R.C.S. (When we say large scale, we mean it!) We tested these changes from Tuesday through Friday with IT and Alpha, and toward the end of the day today, Beta 1 Backers! We’ll be testing again this weekend on Saturday and Sunday. Tech – Audio – Audio Objects: Dave continues his adventures into sound this week with his completion of audio objects. This work removes the “leak” of audio assets in the scene, and gives us more control over defining the proper events for ending looping sounds. Now, during big battles, you should not experience “extra” sounds that should not have been there. Tech – Item Permissions and Equip Restrictions: This week, AJ committed code that will allow us to do things like add restrictions on who can use certain types of gear or set permissions for containers, such as a guild stash. WIP – Tech – cross server scenario: After working on the physics server issue, Colin found time to get back to his original task, allowing players to queue for scenarios from different zones. This week, he’s working on finishing up the zone transition part of the the task, and is beginning work on the logic to determine which server a scenario should start on. Tech – Server Startup and Collision: Earlier this week, Rob improved our server startup process, which helps with stability overall. He also fixed some collision issues that were causing an object’s collision to not match the visual if it was scaled and rotated. WIP – Branching Content System: Bull began work on this system earlier in the week. It will allow us to have different content on different servers. This will make it easier for us to have more timely bug fixes and in some cases, hotfixes. Additionally, it will allow for fine-tuned control over backing up and removing changes to the game, which should reduce the overall bug count. Tech – Terrain Editor Fix: We don’t always put bug fixes in the highlights, unless they are of special significance. In this case, the environment artists have been dealing with a long-standing bug that caused assigned terrain mods to be invisible in the terrain editor. Matt found and fixed this bug, which he theorized has been in there for a long time and only now found as our environments become more complex. WIP – Tech – Crafting: Christina has been neck-deep in crafting. Now, the flow of generating a Vox from a Vox token should be working end-to-end, with the help of AJ and Matt. Players can right-click on their Vox token in their UI, choose deploy, choose the spot they want to place their Vox in the world, and pack it back into their Vox when done. Christina has also been creating mock-ups for the crafting process, which will be the next step for the upcoming crafting UI. WIP – Art _ Environment Art: Dionne is currently working through several new variations of spruce pines, while Tyler has begun work on more variation for our beaches. Andrew provided some great reference from his trip to Ireland, including many pictures of a really great bog he visited. WIP – Art – Updated Character Creation Renders: Joe has moved through the female armor variations for our renders quickly, and is on track to wrap them up around the middle of next week and then hand off to Jon and Michelle. Jon finished the render of the Arthurian Male Physician and the body of the Male Stonehealer. Next, he needs to render out the rocks that will fill out the scene. Art – SFX: This week, dB created a track for our pub buildings, and is moving onto some Realm-specific ambient tracks. Design – Home Islands: Ben began work on a new template for the home islands. This initial blockout, once approved, will then get an art pass on the environment, and testing on creating the buildings. 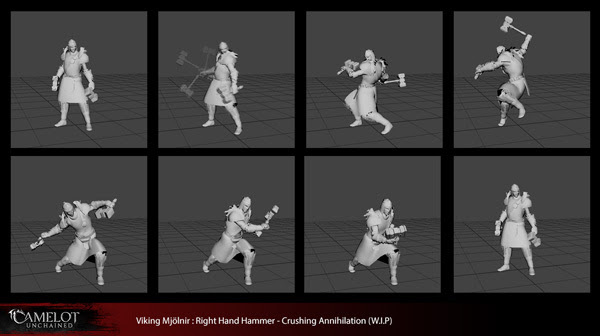 WIP – Art – Mjölnir Animations: Scott moved quickly through much of the Mjölnir’s animations this week. He completed an updated class-specific idle, right and left crushing attacks and deflects, as well as the flinch and cast. If you missed it, you can see his livestream HEREwhere he finished up the new special ability “Crushing Annihilation.” Next week, he’ll wrap up all the movement animations, and then get back to working on the Empath. A very solid week from our hard-working team. Remember, these are just the highlights! Let’s move on to some of the art-in-progress this week, starting off with an image of the Mjölnir’s Crushing Annihilation ability. Next, we have the previously-mentioned paintover of the scenario 2 map from Michelle. I (Tyler) have particularly enjoyed this opportunity to work with Michelle on ways to improve the look of the map. We both have a similar aesthetic sense, so our conversations are typically short, as we quickly come to agreement on what we want to address. I made sure to plan out how the terrain mods were assigned around the map, so we could easily make sweeping changes later. (It’s rare that we artists are happy with the first pass ) In this case, we want to bring the life, or as we keep saying, “the green” back to the map, and bring that in closer to the center. This image also hints at some of the composition changes we want to make to improve the view from certain angles. More to come! Next, we have more trait icons from our recently knighted master of icons, James. Earlier this week, I mentioned to Andrew how I wanted to get to some new environment assets, and he reminded me that he took a bunch of photos on his trip to Ireland. Of particular interest to me was the bog he visited. 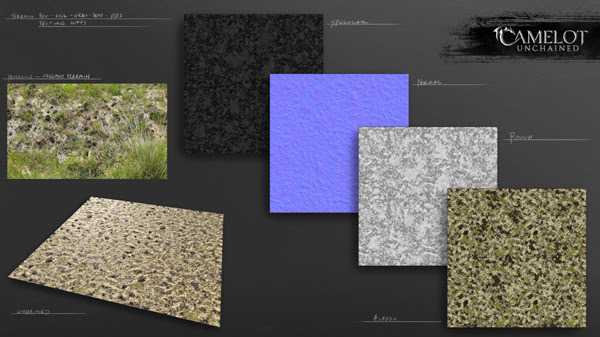 The following two images illustrate two of the ground materials we’ll need. 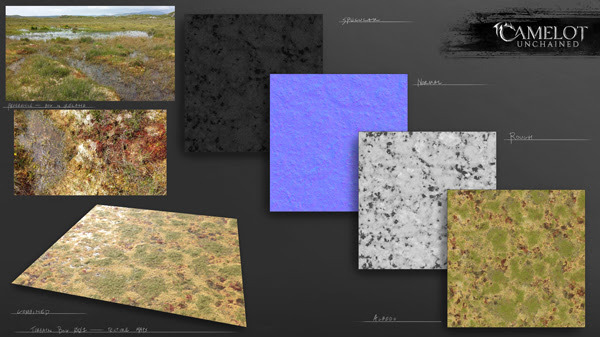 Next week, Dionne will start on the various grass assets, while I continue working on terrain and the editor setup. Once we get more tech in place to better display and place inland water, areas such as this will really sing! 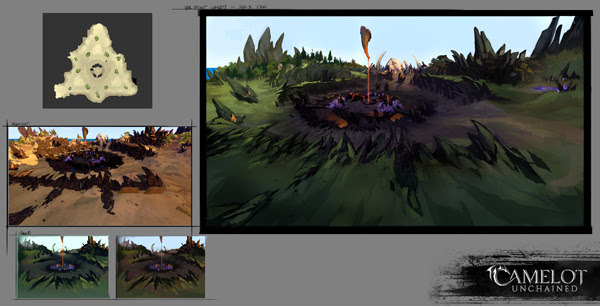 In her livestream this week, Michelle continued working on ideas for the special ability VFX. The image below represents the Winter’s Shadow chillfrost bombardment ability. 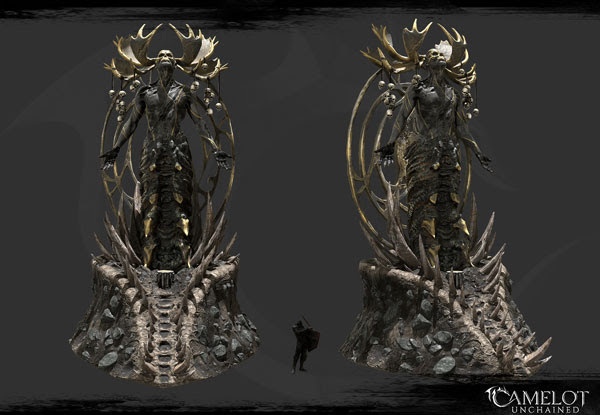 Last but not least, we have Jon’s finished materials on his Depths-inspired TDD statue. I will have to find a place to put this in one of the Beta 1 maps. It would be a fun thing to come across, hidden somewhere in the world. This last, slightly terrifying image, brings us to the end of another good, productive week here at CSE. We’re all working hard toward a solid start to Beta 1 on July 4th, and we can’t wait to see you all there! Enjoy the weekend, and we’ll CU next week!